(Chris Detrick | The Salt Lake Tribune) Utah's Kim Tessen competes on the bars during the gymnastics meet against Brigham Young University Friday, January 5, 2018. 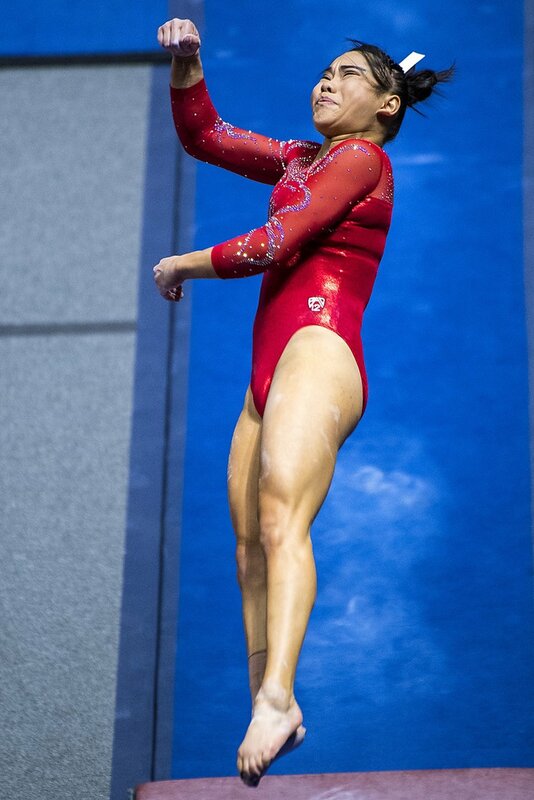 Even the biggest Utes gymnastics fans might have found themselves thumbing through their programs Friday, wondering who Kim Tessen was after she delivered a 9.9 on the vault in Utah’s season-opening win over Brigham Young. This might be the year die-hard and casual Utah fans alike get to know Tessen, a sophomore from Orem. Tessen, who also scored a 9.775 on the uneven bars Friday, barely had introduced herself to Utah’s fans last year before tearing her Achilles tendon in warmups at the fourth meet of the season. The injury was frustrating for Tessen, not only because she’d had a good start to her collegiate career, hitting 7 of 7 routines, but because it was just the latest injury to mar her career. Yet neither the shoulder injuries she had at the club level nor the Achilles tear could deter her from following her dream of competing for a college team. She now hopes her persistence will pay off in 2018. Injuries are just the latest twist for Tessen’s career. Tessen originally committed to BYU as a ninth-grader, but the coaching change two years ago at BYU plus an opening at Utah led to Tessen becoming a Ute. She wants to show she deserves to be on the Utah team as much as anyone. “I used to come here and watch meets, and now this is a dream come true,” she said. 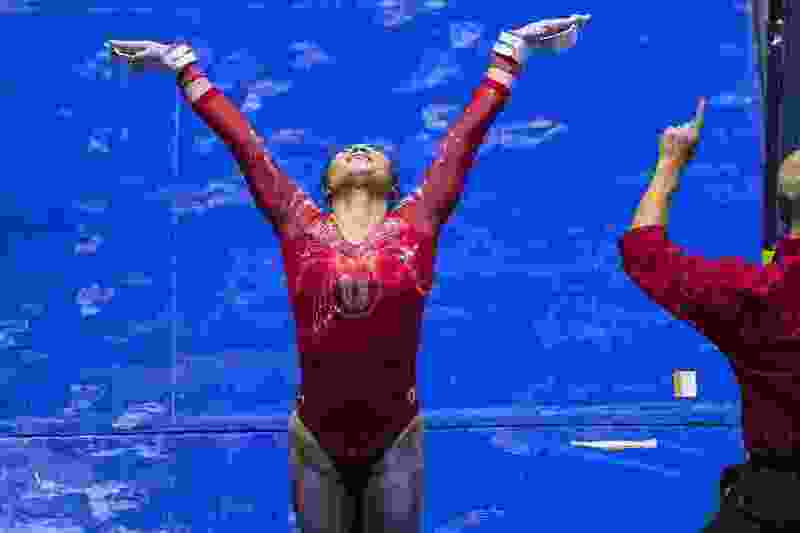 (Chris Detrick | The Salt Lake Tribune) Utah's Kim Tessen competes on the vault during the gymnastics meet against Brigham Young University Friday, January 5, 2018. Utah coach Megan Marsden said Tessen figures significantly in the Utes’ plans, as long as they can keep her healthy. The Utes are managing Tessen’s cranky shoulder by keeping her reps low. She is in the lineups for vault and bars and a backup on beam. Floor is the most taxing event on her shoulder, so it is the last they might add. The good news about Tessen suffering the Achilles tear early in 2017 is that she remained engaged with the team despite being sidelined. Even though she wants to compete on floor, Tessen agrees with Marsden that competing on floor is a low priority. Just being on the competition floor in the other events is enough to satisfy Tessen for now. Of note • Earned 9.9 on vault and 9.775 on the uneven bars in Utah’s season opener. … Missed the final 11 meets of the 2017 season after injuring her Achilles tendon. … Went 7 for 7 and earned highs of 9.9 (vault), 9.85 (bars) and 9.825 (floor) before suffering the injury. … 2016 Junior Olympic National Team member.